A rare possibility. 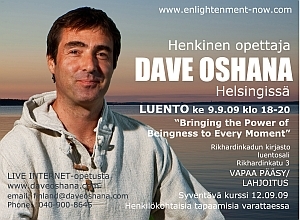 The only public opportunity this year in Finland to understand the way to beingness, awakening and enlightenment as guided by enlightened spiritual teacher, Dave Oshana. This talk is more than just a lecture - it is a chance to experience your full potential simply by sitting. The spiritual path starts with one simple step: simply existing without being lost inside your head from there it is possible that you will directly experience your self, life and others without any labels or prejudices. The present moment is a beautiful space where life in all its fullness and glory takes place. This lecture will give you answers to lifelong spiritual questions and clearly explain the way to end seeking and discover your real self and purpose for being in existence. "According to spiritual folklore, certain Zen masters possessed a gift called “Transmission.” This gift would manifest itself when students would sit with the Zen teacher. While sitting with the teacher, the student would resonate at the enlightened frequency (presence) of the teacher and thereby “see” through enlightened eyes and experience life accordingly. I can say firsthand that Dave possesses this gift." Oshana recently taught on an extremely powerful retreat that the best service that a person can do for others is to "give the gift of beingness". That means that what you really want is to fully feel the presence, acceptance and beingness of another person - and in return they want the same from you. Oshana teaches that Enlightenment is simply being fully awake to each and every moment, to be a full participant in the one time only existence of your human life and the lives of others. If the song is true "What the world needs now is love, sweet love: It's the only thing that there's just too little of. ..." then what the world is aching for is your authentic unconditional love, kindness and attention. There will be time for questions and answers and to meet Dave Oshana afterwards for newcomers to apply for upcoming Oshana Enlightenment Teachings, Energy-Work and Meditation Intensives. Arrive early. Seating is limited to 60, after that standing room only. No entry as soon as lecture starts. Free entry but donations are welcome. Please arrive early to gain entry and a seat. Doors will be shut when meeting starts. New People: If you wish to attend the 12.9.09 Intensive "The Passionate Spiritual Life, The End of Seeking, The Start of Being" then you should attend this event. You can then register your name and ask Dave advice about preparing. One-to-Ones: Personal One-to-One meetings with Oshana are bookable Aug - 11 Sept. A chance to be with Oshana and clear the obstacles from your spiritual path. Live Online Classes: Every Sunday there are live online classes with Dave Oshana (bookable at daveoshana.com as well as free audio teaching). Next classes: 9 Aug, 16 Aug, 23 Aug, 30 Aug and 6 Sep after which there is a break as Dave will teach in UK and USA.